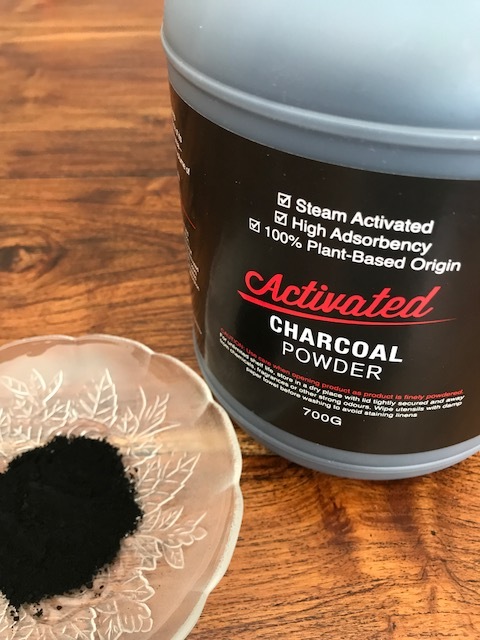 I first bought activated charcoal powder on a whim at a market in Queensland in 2015. I’d never heard of it until that day but was drawn in by the promise on the jar – “The best single detoxifier for whole body cleansing”. Two years on (and well within the 2032 expiry date) some belated research promised me that this special powder has many uses from general detoxification to treating insect bites, acne, stained teeth and more. It’s fair to say I’m late to the party – with records of it being used for medicinal purposes dating as far back as 1550 BC activated charcoal is far from a 21st Century wonder. Anyway here I am, a few charcoal experiments later, sharing what I’ve learnt with you. 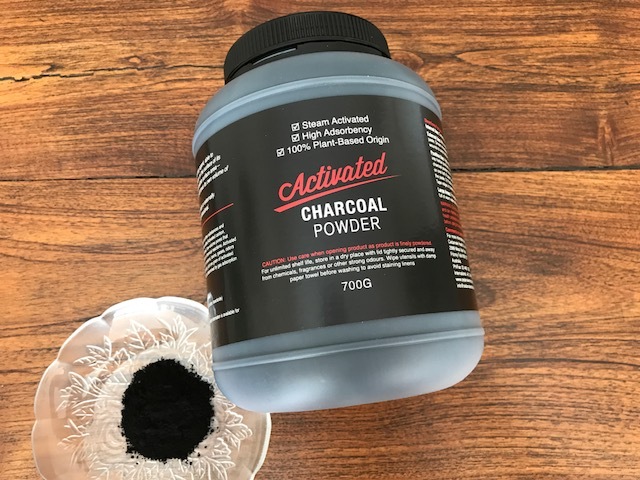 Activated charcoal is a fine black powder. It doesn’t smell or taste of anything and is made from the likes of coal, wood, bamboo or coconut shells. The ‘activation’ process happens through the exposure of ground charcoal to very high temperatures which act to greatly expand the surface area. Unless you live in a pristine environment, eat an organic vegan diet and drink only filtered water then chances are you’re exposed to some dietary and environmental toxins. I know I am – especially because I live alongside a very busy road. So, like me, you may be happy to hear that activated charcoal can remove toxins from the digestive system and promote gut health. Yes, it may not be as #instagramworthy or as tasty as other detox products but activated charcoal could be a good alternative. It works simply by attracting nasty substances to its porous surface and holding them there. Those substances, bound to the charcoal, are then able to safely pass through the digestive tract and leave the body naturally. When you consider that the human digestive tract is around 9 metres long and that one gram of porous charcoal powder can cover 1000s of square feet you can see how a little charcoal can go a long way. Keen to try a charcoal detox? Then I’d recommend doing some research to find a method that will work for you. I’ve tried professional teeth whitening products – some of them expensive and painful and all of them probably packed with chemicals. So I was excited to hear that activated charcoal could be a cost effective, natural and pain free way to remove stains. It works by pulling compounds from the teeth that cause stains. I’m now regularly brushing gently with 1/2 tsp of charcoal powder. This can get messy as the powder has a habit of getting everywhere so it’s worth noting that activated charcoal toothpastes are available. ‘Charcoal removes skin impurities and can even clear up acne’. As a fan of natural skincare claims like this got me excited. So excited that armed with coconut oil and charcoal powder I made a DIY face mask. My skin did feel incredibly clean afterwards but it came at a cost – in the process of preparing, applying and removing the mask I managed to turn my white bathroom black. 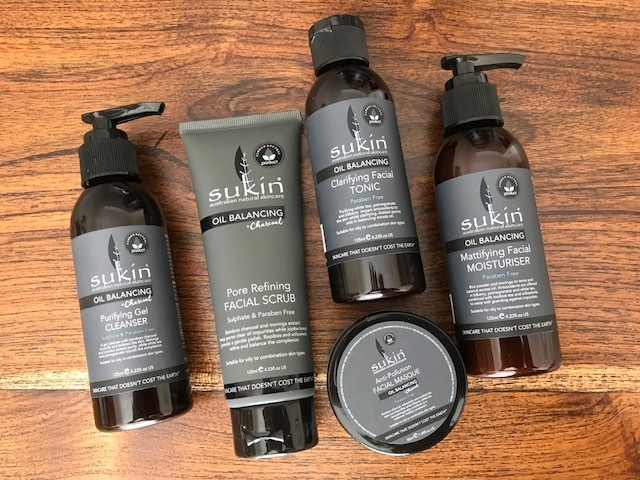 On the quest for a less messy solution I then discovered that Sukin, my go-to Australian brand for skin and hair care, adds charcoal to their Oil Balancing range. Sukin products are all made in Australia with ingredients that are natural, cruelty free and vegan (tick). Their products are also super affordable (big tick). My bathroom is like Sukin showroom at the best of times so I was very pleased when Sukin kindly sent me some Oil Balancing products to try. The bamboo charcoal they use is a key active ingredient and it effectively targets pollution exposure and oil prone skin. With their products you get the benefits of the charcoal without the mess (and clean up) that comes with charcoal powder. 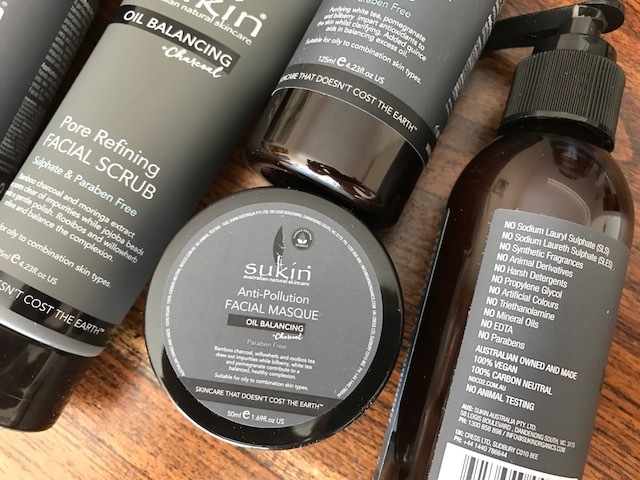 It’s good to see an Aussie brand that’s committed to both avoiding nasty chemicals and environmental protection experimenting with charcoal, and that’s why I’m happily spreading the Sukin word here. For me not a Summer goes by without a good handful of mosquito bites. Living in Australia it’s hard to avoid them, especially overnight when they linger in the bedroom waiting to catch me in a deep slumber. It’s common knowledge among activated charcoal devotees that charcoal powder with coconut oil can be used to treat bites and stings – with the charcoal drawing out the toxins and reducing pain. Usually I just tolerate, itch and moan about the annoying bites so this year I’ll be reaching for the activated charcoal. When it comes to fridge hygiene I’d give myself top marks – usually once a week I’ll remove the entire fridge contents and give it a good wipe down. But this doesn’t always stop odours creeping in. Until now that is. Yes activated charcoal removes unpleasant smells. Yay! The charcoal attracts odours and removes them from the air – it’s as simple as that. I’ll now be placing a couple of teaspoons in my fridge, and shoe cupboard, to keep them in top shape. Finally I had to sneak this in. My research suggests the jury is still out on this one – although charcoal doesn’t remove alcohol from the blood it seems it may help rid the body of other hangover causing toxins. I’m a bit of a lightweight when it comes to alcohol and unfortunately it really doesn’t take more than a couple of glasses of white wine to leave me feeling less than perky the following day. So of course I’ve experimented with charcoal. Not just on myself but on my unsuspecting husband to whom I gave some pre-beer session without telling him of this benefit. Just a teaspoon or so of charcoal before consuming alcohol and we both agreed with felt much fresher the next day. Not an excuse to drink more but certainly a welcome outcome if the charcoal speeds up toxin removal. Charcoal powder is also known for its abilities to relieve stomach discomfort caused by gas or bloating and to act as an antidote to poisons. This latter reason alone is reason enough to keep a jar at home, especially if you have small children or mischievous pets who may accidentally consume things they shouldn’t. In such scenarios charcoal can counteract the dangerous effects of consuming potentially poisonous substances as well as drug overdoses. It’s routinely used in hospitals for exactly this purpose – the charcoal adsorbs poisons and toxins quickly before they can spread through the body with harmful consequences. The charcoal and toxic substance are bound together and then exit the body alongside your poo. I ordered my charcoal online through a company here in Australia called Cedarvale Health and Lifestyle Retreat. Their activated charcoal is made from 100% coconut husks, is medicinal grade and is steam activated. I like to support small local businesses so was happy to find a company close to Sydney that offered online ordering. Have you tried activated charcoal and if so do you have any other suggestions for weird and wonderful uses? 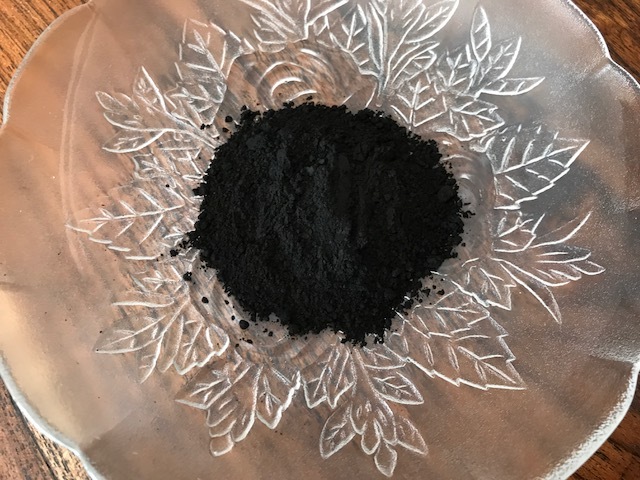 Tags: activated charcoal, benefits, buy, powder, uses. Bookmark the permalink. Amazing post ! Never heard these before, like to start using them ! Thanks Megala – let me know how you go if you do get hold of some charcoal powder…. Laura, this was such a fascinating post. I have never heard of charcoal powder in this context and had absolutely no idea it was so versatile. What an amazing thing. Thanks so much for sharing. I’m very tempted to experiment myself. Hi Tracey I was in the same boat until recently – and I had a jar unopened in my cupboard. It works a treat as face mask and I’m looking forwards to no more painful summer mossie bites! A park ranger was just telling us we should carry it on hikes for potential snake bites! Hi Gretchen – your kind of hikes sound a little dangerous! Yes it’s also good for applying to general wounds too…. Your post reminded me of the activated charcoal teeth cleaning powder that was popular in India. I have used a LoReal charcoal face pack and was so happy with the results!